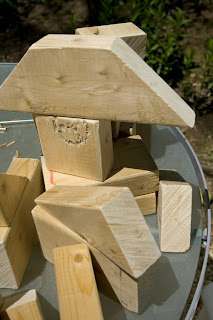 My hubby spent an afternoon slaving away at the saw making blocks for the kids. He bought two 12 ft 2x4's and cut them into different shapes. After sanding and protecting them with a water based finish the whole project cost less than 10 bucks. Compare that to this set which costs 47 bucks plus shipping. Yikes! This would be a great gift idea for any kid over 1 year old. The possibilities of play are endless with blocks, the boys have already built the Legion of Doom and the Hall of Justice right in our living room!